This is not an especially new issue but there is not much information about it so here goes anyway. Some users, but not all, of a customer of mine reported that they could not save their signatures in OWA. After some investigation I found that the users that could save their signature had the an Role Assignment Policy set, “Default Role Assignment Policy”. This was the only policy in use and all users should have that policy. When I did a quick check online, some had reported that the following event with event ID 4 and the error message "The user "username" isn’t assigned to any management roles." where logged in the Application Log on the CAS servers. However, my customer had no such events in the Application Logs on their CAS servers. The users that could not save their signature had an empty Role Assignment Policy attribute set. Exchange needs to have the RoleAssignmentPolicy property (msExchRBACPolicyLink attribute) to be able to determine which settings the users has the rights to change in ECP. This is based on RBAC and if you want to read up on Role Assignment Policies have a look here. Run the following command to view the RoleAssignmentPolicy property. As you can see, the RoleAssignmentPolicy property is empty. In ADSI Edit the attribute you should look for is called msExchRBACPolicyLink as shown below. As you probably have guessed already, the attribute is empty for Test User1. If I go to OWA and try to change some of the options I receive the following error message “Sorry! Access Denied. You don’t have permission to open this page. 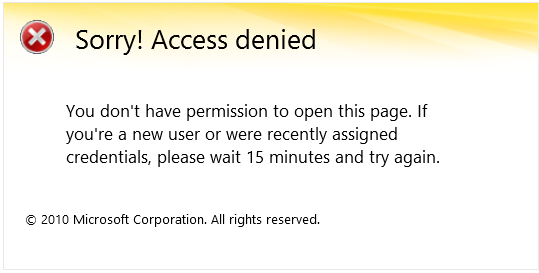 If you’re a new user or were recently assigned credentials, please wait 15 minutes and try again.”. In both Exchange 2010 and 2013 the message looks like this. Much better as you can se, when we use ADSI Edit the msExchRBACPolicyLink contains the Distinguished Name of the “Default Role Assignment Policy”. For Test User2 it works fine to change the settings in ECP. I did some more investigating and found that the reason that this issue occurred for some users was that my customer create some mailboxes using AD Toolkit. When AD Toolkit creates the mailboxes the msExchRBACPolicyLink attribute is not set. This can be achieved in AD Toolkit as well by adding an attribute when creating the mailboxes and specifying the msExchRBACPolicyLink attribute with a correct Role Assignment Policy. Well the easiest way to solve the issues is to add a Role Assignment Policy for the affected mailboxes. To find all users with an empty msExchRBACPolicyLink attribute you can run the following command. And that should be it, all users should now be able to change their settings in ECP. Thanks for reading and do not hesitate to let me me know if you run in to any issues!